With the Ethernet Disk mini - Home Edition, your household's digital library becomes accessible from inside and outside your home in just a few minutes. 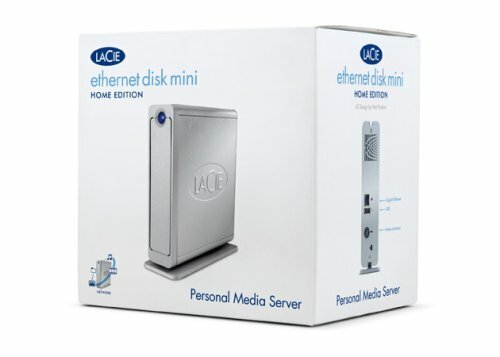 The LaCie media portal, HomeLaCie.com, enables access from anywhere for uploading or downloading files to your Ethernet Disk mini at home. Simply drag & drop your photos, for example, and make them accessible to your relatives and friends via simple email invitations. The pre-defined folders and personal shares enable easy management of your family's digital library. Listen to your music from your networked sound system with the embedded iTunes server. The Ethernet Disk mini - Home Edition provides peace of mind by automatically backing up all of your home computers at your convenience.e. With the LaCie 301269U Ethernet Disk Mini Home Edition 500 GB Network Storage, you can make your digital library accessible to anyone in the world in just a few minutes. This stylish network storage and personal media server not only lets you back up and share your files with your home network users, but it also allows you to access your files remotely through the Internet. Built-in networking, allowing you to share data through the Internet. 500 GB of storage for digital media and other files. Compatibility with uPnP AV, Windows Connect, and DLNA-certified devices. Disk rotation speed of 7200 RPM and at least a 16 MB cache for fast performance. Free one-year online backup service. The stylish aluminum case looks at home in your home or office. View larger. The drive features an elegant design with USB 2.0 and Ethernet ports. View larger. The LaCie Ethernet Disk Mini Home provides an ample 500 GB of storage for your digital media files and lets you share them with anyone in the world. Through LaCie's media portal, HomeLaCie.com, you can provide permissions to friends and family to access photos, music or any other file you've stored on the drive. The Mini Home offers you a great way to share your vacation and travel experiences. You can simply drag and drop photos, music files and even videos from any location in the world to your Mini Home, and within minutes your friends and family can easily access them. They simply log on to your LaCie Media Portal to access your customized menu that will direct them to the shared files. While having immediate access to your videos and music is a great thing, your desktop computers and laptops aren't necessarily the best way to play your media. The Mini Home features built-in media server capabilities that let you stream music to your audio system and videos and photos to your TV. It's also compatible with a wide range of uPnP AV, Windows Connect, and DLNA certified devices, as well as game stations like PS3 or Xbox 360, so you're not beholden to your computer to enjoy your media. But for times when you need to be at your computer, the drive also includes an internal iTunes server that allows you to stream your music to any networked PC or Mac. More than a media player, though, the Mini Home is an ideal way to keep digital photos safe and organized. With the included back-up software for Windows and Mac OS X, you can quickly and easily back up your home computers to your Mini Home, giving you and your family extra peace of mind. With its 500 GB of capacity, the drive can store up to 500,000 photos, 125,000 songs or 500 movies. From any networked computer you can edit your photos or video, and synchronizing your music library between your laptop and the Mini Home is easy. So whether you're at home or traveling, your music library will always be available to you. UPnP streaming lets you easily stream digital media on the Ethernet Disk to any UPnP player. View larger. The LaCie Ethernet Disk Mini Home Edition features a rotational speed of 7200 RPM, a cache of at least 16 MB, and a 400 MHz processor with 64 MB of RAM. It also includes a USB port that allows you to add additional back-up capabilities to your network. The drive measures 1.7 x 6.3 x 6.8 inches (WxHxD) and is backed by LaCie's 3-year warranty. 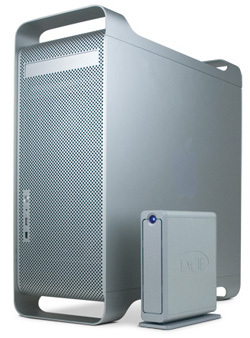 Established in France in 1989, LaCie is a leading manufacturer of computer peripherals for Windows, Apple and Linux users. 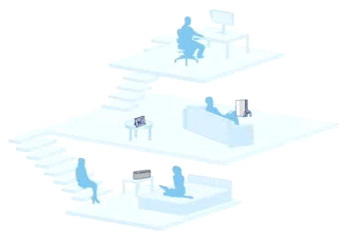 With offices and plants in the USA, Canada, Japan, Australia, Europe, Singapore and Hong Kong, LaCie develops and manufactures external storage solutions and color monitors that help professionals and everyday people easily manage their digital lives. 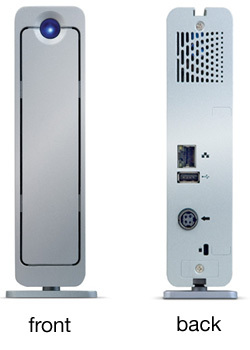 LaCie has differentiated its products through original designs and leading-edge technology. LaCie Ethernet Disk Mini Home Edition, Ethernet cable, external power supply, drive stand for upright use, CD-ROM with Easy Install, and quick install guide. Play back videos on your TV with PlayStation 3 and Xbox 360. I bought the 750G version of this HD. After only five months the HD just stopped working with no rhyme or reason. The company sent me a new power cable, but the drive itself does not allow me to access the more than 100G of information I entrusted on this product. The new power cable allows the drive to actually spin and the fan to run, but the lack or support given by Lacie doesn't allow me the chance to access my files. Third LaCie HD I've purchased -all in use. Other models are backup for individual Apple computers and this one (301270U) will join AirPort network soon as I can determine software setup. Virtually no printed guidance and online is scant so far as I've been able to find. However, a solution WILL be found! I am not very happy with this thing. When I first got it, it tried to update the firmware, and locked up. LaCie were quick with product support, and told me how to restore the factory defaults, and then it updated smoothly. But next it kept disconnecting and locking up when I copied large volumes of data to it. LaCie said this might be due to the power supply, and sent a new one. Now it seems much more stable, but last night it disconnected and locked up when I copied a 25Mb file. So it seems I can use it, but only for small files. After trying different options, I have junked the thing. It keeps failing, is extremely unreliable. No more LaCie products for me. After doing a ton of research on network attached storage devices, I opted for this well reviewed LaCie. I'm sure it does it's job well, it's just that I'm not a strong network guy and I found the set up cumbersome, confusing and unsatisfying in the end. Don't get me wrong.. I'm a bit of a tech head... I've built my own computers, have no problem reinstalling an operating system from scratch, rebuilding or upgrading a computer system, etc. I was mainly looking for a way to backup my laptop wirelessly on my network. My main computer is a MacBook Pro and I've been using OS X's Time Machine to do my backups.. I've been very happy with it and it's saved me a couple of times already. Well, after set up of the LaCie, I realized I had to set up an account via the LaCie website in order to use the drive at all. I then realized that Time Machine wouldn't easily backup to a network attached storage drive without some tweaking. I also didn't like the way I accessed the drive... it was confusing to set up and I never really got it going. This drive makes a racket even when no one uses it. I'm not sure what it is busy doing, but I would think it should go into an idle mode most of the time. It does not appear to do that. I have only owned it for a month and have not figured out if there is a configuration step I missed. Had this great toy since 3 months now and I can access my files wherever I go. It is simple to set up and to use. Easy to back-up and has a USB plug for printers and other USB drive. I have not tested the security of data, but I would not trust any of these networked device for sensitive information. 1. It is as slow as online reviewers say. I'm using a 100MB network, dunno if its faster over GigaBit network. 2. I had hoped that user access cotrol would be similar to that of windows shares. i.e granular control over who can access what shares. 3. You cannot create your own shares, you only have the defaults. FamilyShare and MyLibrary. 4. FTP access not simple to setup, I still haven't done it, because it was not straight forward the 1st time, and i work in IT (programmer not networking). If it annoys me, how will a non technical person do it? 5. Cannot use Partimage to create ghost my HD image to it over the network, doesnt seem like Linux much. At least not from bootable CD's. 6. Conversely, I did Vista's Image Backup and restore of 38GB's to it and it worked fine, slow though. It started out so promising -- a network storage device for under $200, capable of acting as a media server and with access anywhere as long as you have internet connectivity. The read/write speed was never good, even with the laptop connected to the router on a wire. The read/write speed of my iOmega portable external drive, connected via USB, was blazingly fast in comparison. Nevermind wireless (54-mbps g network) -- I rather watch the paint dry. I then started having issues with my music files (stored in the FamilyMusic folder) and the iTune server. I was unable to see the files if I am connected via the browser. The iTune server doesn't load half of the time even though it is visible within iTune. At some point, even when it does load, it loads only a fraction of the music files. I still use it to store photos and as a file server for files that I don't want to carry around on my laptop all the time. As far as using it as a music server is concerned, I am looking for something else. Lastly, LaCie should really make this device to support Wake on LAN. I have intermittent accessing sub-directories that I didn't create with Windows Explorer. No such problems via the web interface. I bought it in spite of the bad reviews because I always liked the idea of having 1TB available to my whole network.. and I got what I deserved.. I can live with it being big, heavy and noisy.. but it also had to be terribly slow! It can't even stream video fast enough! I never got any transfer rate above 6 Mbps. The regular rate stays in 2~3. And I have done all updates available. This product is a complete embarrassment for LaCie, and they should be ashamed to put it on the market. I have owned this drive for 7 months now and it works very well. All of my files were moved from my three computers onto it so each can now access anything. I got the rest of my family to create folders on the drive so they are using it too. Even my iTunes library is completely on here. I made sure to create a backup of this drive too, which I update regularly. LaCie mkes a great product, but packaged with poor software, minimal instructions and hardware/software that ultimately did not work was a killer for this product. I was looking for an external hard drive that I could keep at home and access over the internet. I have an Apple Airport Extreme and an iMAC of which the "Ethernet Disk Mini Home Edition" was connected to the Extreme via GB Ethernet. So far so good. After the software failed to recognize the existence of the newly installed hard drive for about 3 attempts, it all of a sudden recognized it. Yeah, great, now let's get this thing running. The skimpy instructions comprised about 10% of what I had to dig up on the internet to even get close to getting this thing to work. After a couple of hours, opening up several ports, and entering a bunch of poorly documented parameters into LaCie's host site, it finally, sort of worked. Every time I got into the LaCie Home Drive with my MacBook Pro, I would have to log in. Not a problem. Very slow data transfers, but it did actually limp along with the iMAC in sleep mode. The problem started with the inconvenience of having to log in from my local iMAC to access the local LaCie Home drive. Not just once, but for each and every folder on the drive. Nuts! Again there was extremely slow data transfer rates. Next I decided to change some of the security setups, like a different password. Fine, except the lame software again failed to recognize the existence of the hard drive. Forevermore the drive couldn't be seen by their own software. Then after too many futile attempts to get their software to work, the iMAC eventually couldn't log into the hard drive. Keep in mind, that everything in the initial setup was painfully slow too. Each individual parameter gets written to the drive one parameter at a time. First comes the password - and it takes 10 minutes? Next parameter - and it takes another 10 minutes? Come on guys. Hello! It's right over here! Setup took about 7 to 8 hours - full of frustration as you could imagine. The answer to remote data access by several computers of the MAC variety is to open a ".MAC" account. .MAC is fast, well behaved, packed with tons of features that are simple to set up and use, and it's convenient. If you love your MAC and Leopard, you will love setting up .MAC (about 15 minutes for the pair of MAC's) and using it's rich features. The other LaCie hard drives are fast and reliable and have always been a favorite of mine, but this one is rendered into a dumb brick by extremely poor and incomplete software, questionable hardware, and a frustratingly difficult user interface when it decides to limp along on its terms.